More than two miles below the ocean's surface, microbes, worms, fishes, and other creatures great and small thrive. 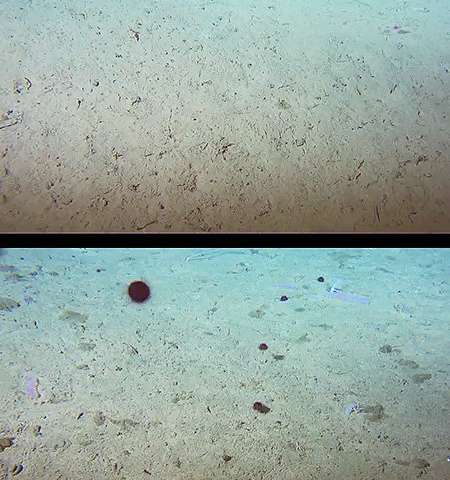 They rely on the transport of dead and decaying matter from the surface (marine snow) for food at these dark depths. 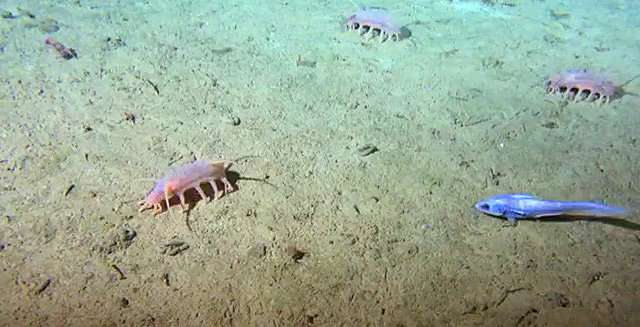 This supply of carbon to the deep sea isn't steady. At times, months' to years' worth of marine snow falls to the abyss during very short "pulse" events. MBARI Senior Scientist Ken Smith has studied how deep-sea communities respond to changing carbon supply for the last 29 years at a deep-sea research site called Station M. This long-term monitoring site is 4,000 meters (2.5 miles) below the ocean surface and 220 kilometers (124 miles) off California's coast. This is the only deep-sea site in the world where continuous supply and demand of carbon are recorded in detail as a time series. A suite of autonomous instruments at Station M helps researchers study the pulse events and their impacts on deep-sea biota. Two sets of sediment traps, suspended 50 and 600 meters above the seabed, collect the sinking marine snow every 10 days. 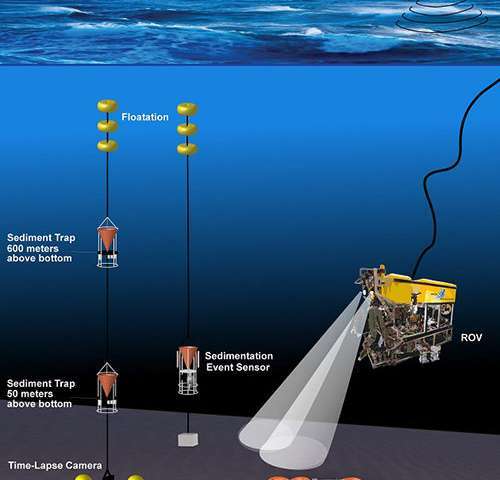 On the bottom, time-lapse cameras take hourly photographs of the seafloor, which help scientists detect changes in amounts of marine snow and changes in animal communities. Since 2011, MBARI's Benthic Rover, an autonomous underwater vehicle the size of a small car, has crawled 11 kilometers (seven miles) across the seafloor at Station M. It measures oxygen consumption by microbes and animals on the bottom, allowing scientists to estimate how much food (carbon) is being consumed. The PNAS study focused on six periods between 2011 and 2017 when large amounts of marine snow reached sediment traps at Station M. During these episodic pulse events, four times more carbon reached the deep sea each day, in comparison to non-pulse days. Compared to the first 20 years of the time-series, pulse events became more prevalent after 2011. Of the total carbon that reached the sediment traps at 3,400 meters depth from 2011 to 2017, over 40 percent arrived during the pulse events. "These events are becoming a much bigger part of the carbon cycle," said Christine Huffard, a marine biologist at MBARI and co-author of the study. In fact, since these pulse events have become larger and more frequent, researchers have had to double the size of the collection cups used in their sediment traps. The pulses of food (and carbon) to the deep sea are not currently taken into account in global climate models. The "Martin curve" formula, which is based on sea-surface conditions such as water temperature, is widely used to estimate how much carbon reaches the deep sea. Huffard and her coauthors found that the Martin curve matched their data well on non-pulse days, but it underestimated the amount of carbon arriving during pulse events by 80 percent. "In total the Martin curve estimated only half the deep-sea carbon that we measured," said Huffard. These findings have implications for how the Martin curve and similar models are used to prepare global carbon budget estimates for Intergovernmental Panel on Climate Change Assessment Reports. "We need to find a way to evolve such models so that they can capture these events, given their overall importance," Huffard said. As a next step, the research team will be looking to study individual pulse events more closely. Huffard pointed out that many questions remain unanswered. "What makes each pulse different? Why are they so much more prevalent now than previously? What surface conditions lead to their formation?" she said. "If we understand that, we can possibly model pulses from satellite data, so our global models can more accurately predict global carbon budgets." 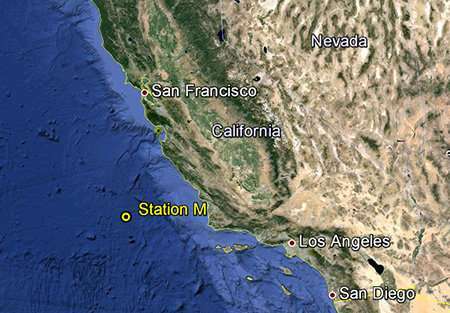 "We would love to have 50 Station Ms all over the world, but we can't," Huffard added. "Realistically we need to model this using the global coverage provided by satellites."